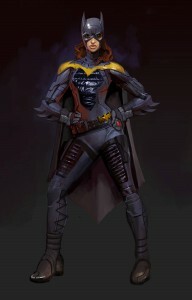 Bio: Barbara Gordon is the daughter of Gotham detective James Gordon and long time associate of Batman. After an attack by the Joker leaves her paralyzed and in a wheel chair she is forced to step down from active superhero duty and get a more behind the scenes role as Oracle. The rise of the Regime and the death of her father result in her looking for ways out of the wheel chair. With the help of Lex Luthor, who creates a special version of the super pill and treats her legs with it, she is able to once again put on the bat cape and actively join the fight. Tactical Advantage: Batgirl and her teammates each start the match with 1 bar of POWER. 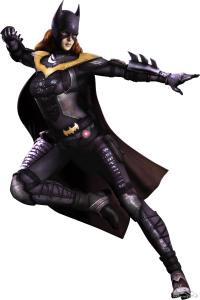 Art of Deception: Batgirl uses a smoke bolb to cover her as she attacks from a distance. Redemption: Batgirl uses her exceptional agility to gain the upper hand over her opponent. High-Wire Act: Blending death-defying acrobatics with overwhelming force, Batgirl smashes her opposition. UNBLOCKABLE. 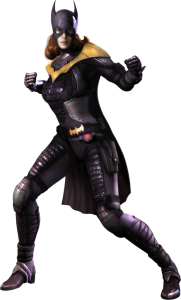 James Gordon: +10% Health for all Batgirl characters. Sensei Dragoncat: +10% Damage for all Batgirl characters. 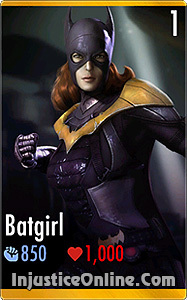 Birds of Prey: +10% Energy Regeneration for all Batgirl characters. 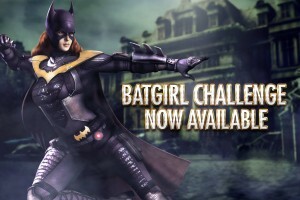 Batgirl is one of the most popular Injustice Mobile characters due to her high stats and her passive ability. She can be combined with powerful characters to give the entire team a deadly advantage.